Involving a younger relative in your wedding can be a complicated topic in many families. Older teens are generally made bridesmaids, and revel in the experience. Younger girls of a wide range of years are flower girls; we've had proud new dads carry newborn flower girls down the aisle, and girls as old as ten. Tweens and young teens, however, are a different story. While they're still too young to be considered a bridesmaid (attending a bachelorette party, for example, wouldn't be appropriate), they would likely feel that being a flower girl isn't the right job either. The position of "junior bridesmaid" is perfect for girls between the ages of ten and fourteen (sometimes more mature younger girls or less mature older girls would be grouped into this bracket as well; it really depends on the family, the group dynamic, and the situation). Being a junior bridesmaid gives young women a taste of what adulthood is like, but without the responsibility of being involved in much of the wedding planning or other related events. 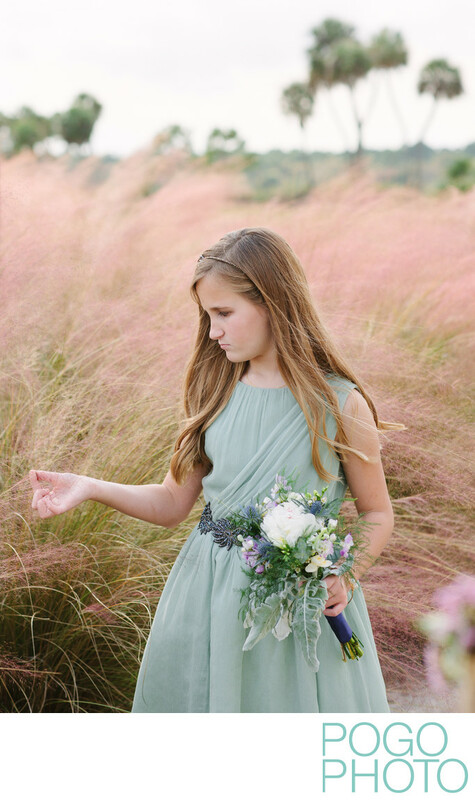 The muhly grass blooms in October and November in South Florida, and is often planted as a fluffy filler plant in landscaping and golf course planning, making for a lovely blush of soft pink in the background of many fall Floridian weddings. In contrast to many other plants in the area, this grass has a muted, almost pastel look, which can complement a gray or overcast day just as beautifully as a brilliantly sunny one. We always look for the distinctive pink grass in the fall and are thrilled when it shows up en masse at the venues our clients choose, such as the Jupiter Country Club between Jupiter and Jupiter Farms, in northern Palm Beach County, Florida. Location: Jupiter Country Club, 126 Rosalia Court, Jupiter, Florida 33478. 1/1000; f/4.0; ISO 200; 85.0 mm.